Upgrade your Water Treatment and Distribution Licenses while working toward your University Certificate! 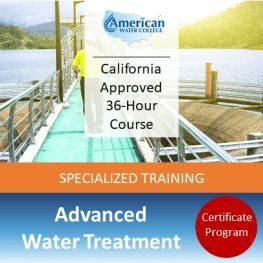 This 36 hour (3.6 CEUs) course is approved as Specialized Training in the state of California for water treatment and distribution system operators. This means it can be used to meet your Specialized Training requirements for upgrading your certifications to Grades 2-5. Double Duty! This course is also part of our Water Treatment Technology Certificate Program offered in partnership with California State Universtiy, Fresno. You can satisfy your Specialized Training requirement and earn credit towards your certificate at the same time! Upon successful completion of the course requirements, students will receive a certificate of completion which is applicable toward your Certificate in Water TreatmentTechnology from American Water College and California State University, Fresno. Please refer to the course syllabus for more information about the course content and the required text books that must be purchased separately. "Great course with lots of material, definitely worth the money. This course cuts it down to what is going to get you to pass."